Throughout the primaries and general election campaign, many observers have expressed puzzlement at the support for Donald Trump among white evangelical Protestant voters. Why would evangelicals rally behind a thrice-married candidate who is not widely viewed as particularly religious and whose views on the issues have not always aligned with the preferences of most evangelical voters? Evangelicals cite other reasons for supporting him beyond opposition to Clinton. Roughly one-third of evangelical Trump supporters also pointed to his issue positions as the main reason they support him, and about one-quarter (26%) mentioned his status as a political outsider who will bring change to the political system as a reason for backing him. One-in-five said they support him because of his personality and “tell-it-like-it-is” style. In addition to the open-ended question, the survey asked Trump supporters whether each of a number of specific characteristics is a “major reason,” “minor reason” or “not a reason” for backing him. Overall, evangelicals’ reasons for supporting Trump mirror those of Trump supporters as a whole. 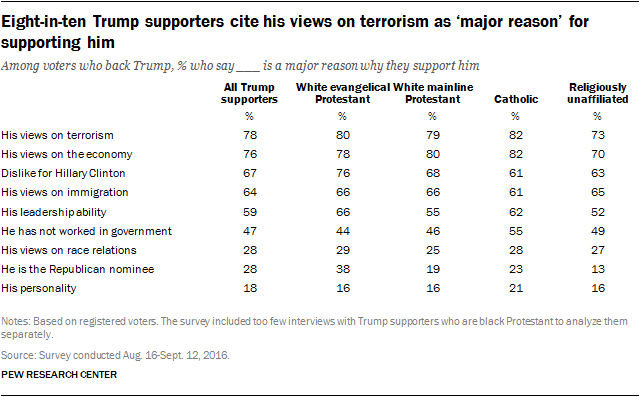 Eight-in-ten white evangelical Trump backers said his views on terrorism are a “major reason” for their support. A similar share of evangelical Trump supporters (78%) said his economic positions are a major reason for backing him, and 76% cited dislike for Clinton as a major reason for their support. Two-thirds of evangelical voters who support Trump said his views on immigration and his leadership ability are key reasons they favored him, while 44% said they like the fact that he has not previously served in government and 38% are backing him because he is the Republican nominee. Fewer said they back him because of his views on race relations (29%) or because of his personality (16%). This post and its graphics have been updated and corrected due to an earlier error in the way white evangelical and white mainline Protestant respondents were categorized in the survey.